We are stepping up efforts on the Coromandel to help prevent the spread of the disease kauri dieback which has killed kauri trees in Northland, Auckland and Great Barrier Island. 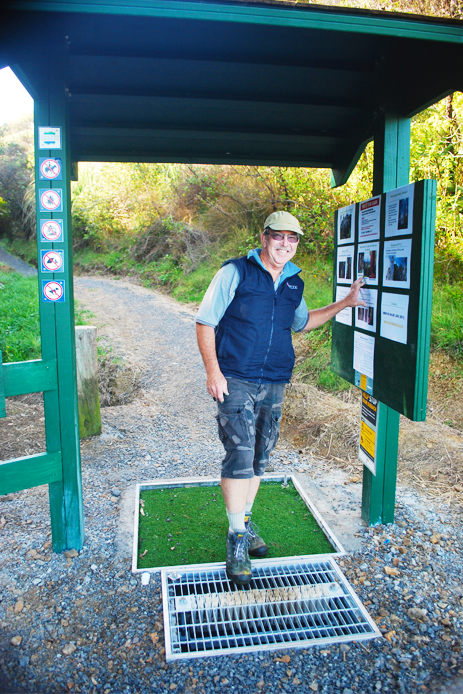 While no kauri dieback signs have been detected on the Coromandel area, our new boot-cleaning kiosks are designed to help stop the disease—officially known as Phytophthora taxon Agathis or PTA—from getting established here. "The new measures involve installing permanent boot cleaning stations at Coromandel sites where kauri trees are situated to reduce the risk of kauri dieback being spread. The cleaning stations include walk-through troughs containing a disinfectant called Trigene which kills PTA spores." The first has been installed at Long Bay Camp Group. Other cleaning stations will be installed at other locations in the future. These steps are part of a wider collaborative effort involving MAF Biosecurity New Zealand, the Department of Conservation, Auckland Council, Northland Regional Council, Waikato Regional Council, Bay of Plenty Regional Council and Māori. These agencies are working together as one team to ensure the integrity of kauri ecosystems remains, to protect high value kauri areas and iconic kauri trees. In the Waikato, the regional council has been working closely with us given that our district is home to many kauri. That local collaboration has involved identifying suitable sites for cleaning stations as well as information sharing. PTA is a fungus-like disease. Its microscopic spores in the soil infect kauri roots and damage the tissues that carry nutrients within the tree. Infected trees show a range of symptoms including yellowing of foliage, loss of leaves, canopy thinning, dead branches and lesions that bleed resin at the base of the trunk. Nearly all infected kauri die. Scientists are currently working to find control tools for this disease but there is no known treatment at this time. In the past 10 years, kauri dieback has killed thousands of kauri in New Zealand. While human activity is thought to the main cause of the disease spreading, PTA may also be spread through groundwater and soil on animals. Spores of kauri dieback were first discovered along with sick kauri on Great Barrier Island in the 1970's. Identification methods at the time led to these samples being misclassified as a morphologically similar species. Kauri Dieback was formally identified in April 2008. Its closest known relative is a chestnut pathogen from Taiwan (Phytophthora katsurae). Kauri Dieback is believed to have been introduced from overseas.